Box Full Of Coins Finance PowerPoint Templates And PowerPoint Themes 1012-Use this Amazing PowerPoint Template for Money Investment. This Template Shows the Number of gold coins coming out from the box. Use this Powerful Template for Business, Marketing, Financial and Banking Presentations. This Refresh equations with our Box Full Of Coins Finance PowerPoint Templates And PowerPoint Themes 1012. Strenthen old bonds with your thoughts. 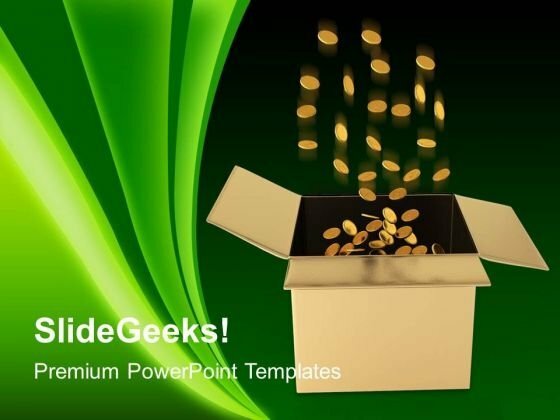 Feed off the brilliance of our Box Full Of Coins Finance PowerPoint Templates And PowerPoint Themes 1012. Satiate minds with your ideas.